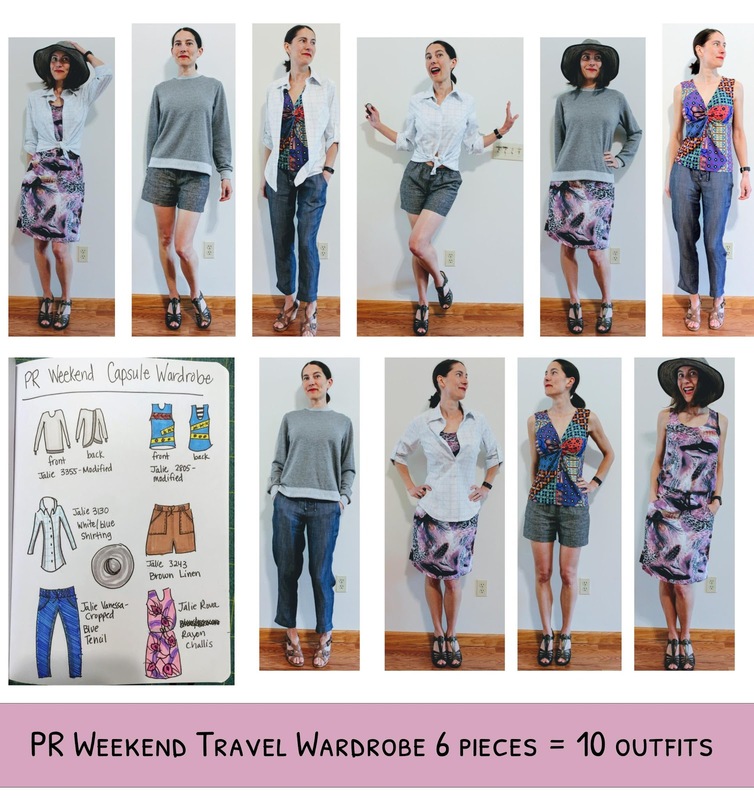 Well, even though I was unable to go to PR Weekend at the last minute*, I DID get my capsule wardrobe done. I think it turned out rather nicely, if I do say so myself. I made three shirts and two bottoms. The dress was already done. If I was really taking this on vacation, I would change up the shoe choices. I would include a pair of flat tennies and a low-heeled, neutral sandal. I love all the pieces individually and I love them together. I added some detail shots below so you can see individual details too. I really like how this sweatshirt turned out. At first, I was worried it would be too baggy, but it turns out it's the right amount of slouchy and dressy (if you can say that about a sweatshirt). These pants are dead comfortable. I love this button-up shirt pattern. It fits so well with zero modifications and it's fabulously drafted! There are close-up and detail pictures here. I love this pattern and have made it so many times. There are more detail pictures here. I love this top and have made it many times too. This time, I made it out of a rayon knit. I added two straps across the back. I love this fabric. It's Nicole Miller fabric I bought on clearance (shhhhh, don't tell!). *Unfortunately, there was just no way I could go - long story. I'm super sad about it, but there was no way to avoid it. Maybe next year?!?!??! I recently bought an off-the-shoulder top for one of my twins. She liked it so much, that I decided to make another out of the (*cough, cough) copious amounts of fabric I have. I bought a very pretty rayon challis a while ago and it was begging to be turned into a girls' top or dress. In diameter, they measure exactly on the size 134 even though they are 11 years old. They are long and lean, these two. I ended up making the size 140 but lengthening it to the 152 length which was about two inches. Thank goodness for that since she needed the extra length. It's a simple top with elastic at the bottom of the arms and elastic around the arms and across the bodice and back. The shoulder ties keep it up on the shoulders. I made the bodice/back/upper arm elastic a little smaller than they recommended and I probably shouldn't have done that. It's snug and makes the top want to ride up a bit. It's not too bad. We'll see if she gets annoyed. The directions called for making a casing and then sliding the elastic into the casing and then connecting it. Instead, I attached the elastic like I usually do to a knit and serged it onto the raw edge, folded it over and zig-zagged it. It's great except it's not easy to modify the elastic is needed. Dang it. I like the cute little shoulder ties. This time of year is always SO BUSY. I'm hoping in the next few weeks I'll be able to actually sew. I am going to PR Weekend and I'd like to make some special stuff but I don't know if I'll have any time!! !